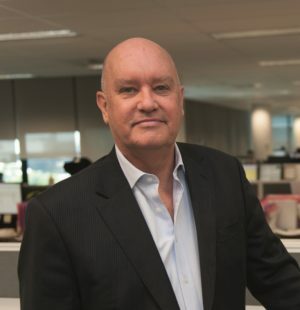 Dr David Cooke is Chairman and Managing Director of Konica Minolta Business Solutions Australia, a subsidiary of Japanese technology giant Konica Minolta Inc. In this exclusive interview, David reveals the key factor driving sales success in an otherwise declining market, and calls out the intrinsic concern for the customer seen in Japanese companies. What is the company experiencing in the market today? Printer sales have declined steadily over the last few years, reflecting the move to storing and accessing information digitally, often via mobile devices such as phones and laptops. This has prompted manufacturers to rethink new product developments and seen Konica Minolta globally enter new markets such as Industrial Print, with very high-end digital printing equipment that competes against traditional offset processes. In Australia, we’ve also begun to partner with international firms operating in other technology fields such as US manufacturer 3D Systems and Danish robotics manufacturer Mobile Industrial Robots. We believe our ability to meet a broader range of customer needs is what will ensure the sustainability of the company well into the future. Sales people are often trained to pitch price and product features. Has the changing business environment required a different approach? I believe the market has changed in several ways. One is the move from hardcopy printing to digital storage of information but also, quite independently of this, I believe we are witnessing consumers and business procurement decisions being based on a broader range of criteria than ever before. We’re seeing purchasers look for elements well beyond simply product and price. This is particularly true in markets where products and services are seen as relatively undifferentiated. We’ve been fortunate to have been awarded a number of large contracts in recent times where our new clients have given us feedback that our Values were the deciding factor in the choice of a new supplier. They’ve alluded to our Workplace Gender Equality Agency accreditation, our family & domestic violence policies, our active participation in partnerships with the not-for-profit sector and our advocacy around the marriage equality debate and the introduction of an Australian Modern Slavery Act. As a values-driven business, how do you instil the company’s values in your people and how do you take them on the journey? When I was appointed Managing Director nearly six years ago, there were a few things that I was going to change on day 1. One was not moving into the very large former MD’s office with great city views but removed from the business. The other was to knock down the wall that separated HR from the rest of the business. I had also made the statement on day 1 that “I wanted us all to work together to build a company that really cared. Cared about our employees, cared about our customers and cared about our community”. I think a key to any change program is to be consultative. Following that, I turned to our 400 team members (we’ve grown to 500 now) for advice and asked them what had to change. Their number one request was more communication, from senior management and between departments. Secondly, they asked for more purpose. It was from that second request that our strong relationship with charity partners was born. This allowed our staff to participate via a salary matched giving program and paid volunteering leave whereby they could offer their skills and experience to our partners via a range of pro bono activities. What are your biggest learnings from some 25 years of doing business with Japan? I’ve learnt to be patient! Our parent – and I have found this to be true of other Japanese manufacturers – tends to err on the side of perfectionism. I’ve seen products emerge from our R & D that I’d assess as being ready to launch, that don’t see the light of day for years as they undergo repeated quality assurance assessment and refinement. I find the business culture in Japan is one of being somewhat risk averse. Also the hierarchical system of management can at times stifle agility and flexibility, which runs counter to a more entrepreneurial culture and can lead to opportunities being missed. What I’ve learnt, though, is that there is always deep concern for the customer and for delivering on high standards of service to ensure high levels of customer satisfaction. Throughout much of its 150-year history, the brands (Konica and Minolta merged in 2003) were synonymous with photographic products, however the company exited this market in 2006. Today the core products manufactured by Konica Minolta still utilise the high quality imaging technology, however the focus is on network printing and scanning devices for the B2B market, accompanied by document and print management software and medical imaging products.